It is discouraging that in spite of the remarkable development of society and science in modern ages, the beauties of nature are gradually driven away from us because of it. That is particularly so when we think of children who always get excited when they run about in the mountains and fields looking for insects. Each of us has a vivid memory of our childhood when we did just the same. Now the more you get acquainted with ways of living and systems of the insect world, the more clearly you will find similarity between insects and our species. Moreover you will come to know that even their emotion is very much like ours. So we cannot but feel sense of wonder as well as intimacy when we observe the social and family lives of such insects as bees and ants. We also see that children and insects have common pleasures of association with the nature. This animated series is a drama full of poetic sentiment and adventures that develops with the honeybee world as its subject, and it will be of great help to the young generation to familiarize themselves with the wonderful nature. 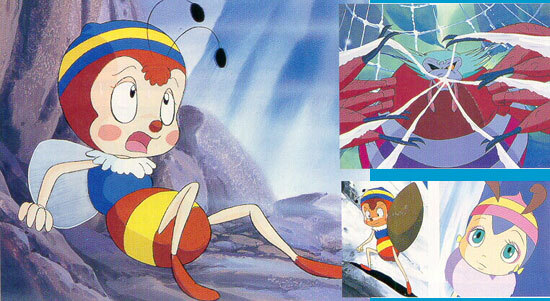 Hutch unfortunately becomes orphan and is thrown out of the honeybee community which used to be beautiful and peaceful. He then goes on a lonely journey looking after his mother whom he has never seen. The nature outside looked wonderful with his its freedom and sunny fresh air. But he is not allowed to just sit down and admire the beauties. He has to go through a variety of experiences. Sometimes he becomes dejected and is ever exposed to danger. Through these difficulties, however, he learns the spirit of love, courage and perseverance. With the firm belief of meeting her mother sometime somewhere and with pride in his honorable honeybee family, Hutch keeps on his painful but hopeful journey.